February 27th is National Strawberry Day. 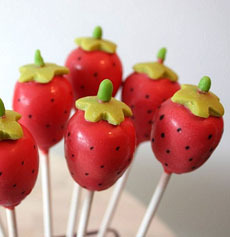 What better activity than to make these luscious strawberry cake pops from Lauryn Cohen of BellaBaker.com. If you’ve never made cake pops but think they’d fit in with family and entertaining, there’s a fool-proof appliance to make round balls of cake: the Babycakes Pop Maker. There are several cake pops recipe books to help you become an artist. This recipe book has 175 different recipes/designs. If you like to decorate, you’ll be set for many hours of food fun.